"When I teach, I want to give my students as much as they can digest. It is very rewarding to witness the progress." Outi is a highly respected teacher. She has students all over the world and she also travels internationally to give workshops. Outi emphasises building a strong technique on which the student can base her own dance style. Outi specializes in the Egyptian style of Oriental dance and interpretation of music, as well as many other Middle Eastern folkloric dances. She also does coaching for aspiring performers, sharing with them what she has learned when dancing for the demanding Egyptian audience. Even though her repertoire consists of variety of subjects Outi has become known for her clever way of teaching Egyptian technique for foreigners. Her new on-line workshop is all about how to dance in a more Egyptian way. 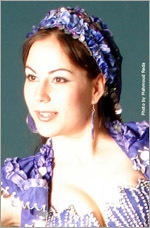 She is also frequently asked to teach milaya technique and dance routines. In addition to these topics and Egyptian style oriental (including balady and shaabi) Outi teaches most Egyptian folkloric styles (saidi, haggala, nubian, fellahi, ghawasee, simsimeya) as well as khalegy from the Gulf. She is available for private classes in Cairo as well as workshops worldwide. Contact Outi for rates and to arrange your class. "Outi is really the best kept secret... terrific performer and instructor." "I recommend Outi's classes to give your dance the true and relaxed Cairo feeling, musicality and latest Egyptian technique." Outi is giving private classes via Skype to all over the world. If you are interested of new technique, Egyptian style or just want some new ideas for your dance, contact Outi for some privates. Some slots are available at the moment! These classes include different technique each time. They are lot of fun with cultural information included. There will be workshops in Finland and other countries in the Autumn 2015. More information later! During this class Outi will give you ideas how to adapt folklore styles in oriental performance. She will demonstrade the differencies in the folklore performance and oriental style dance. She will concentrade on the steps, style, feeling and also talk about the music. During this workshop Outi will demonstrate different techniques used by Egyptian dancers. She teaches how to use weight changes and muscle contractions to change the quality of the basic movements.